I guess I’ve been on a bit of mint kick as of late. It’s yummy in desserts and makes a great garnish, but more over it’s an herb that’s entirely underutilized for savory dishes. This dish came together in my head while spec’ing product at work this afternoon (a not-so-creative left brained activity). The right side of my brain was feeling under-utilized writing tables of messaging requirements, so I started thinking about what to make for dinner. I think the idea of making noodles out of asparagus came first, but it was quickly followed by something to accompany it. I happen to have a nifty multi-blade razor thing from Japan (pictured below) so I just give a stalk one pass, then rotate it 90 degrees and give it another. If you don’t happen to have one of these things laying around your kitchen, you should be able to do this with a sharp knife (or mandoline) and some patience. If neither of those options don’t work for you, you could always leave the spears whole then serve it with the pesto to dip. I’d have to say I was pretty happy with how the pesto turned out given that I’ve never made it before and the last time I had pesto on anything was ages ago. I could just eat this out of a bowl with a spoon, but I imagine it would be good on bread, in a sandwich, on regular pasta or served with lamb chops. It’s full of umami, earthy and creamy, but the mint and lemon juice add some brightness that makes this more versatile than other pesto’s I’ve had before. I'm sure you could make this in a blender, but I didn't want to get a whole blender dirty for this, so I used a mortar and pestle. Put the pine nuts in a mortar and crush using a pestle. Add the mint, garlic and salt and continue to crush until you have a paste. Add the lemon juice, oil, cheese and pepper, stirring to combine. 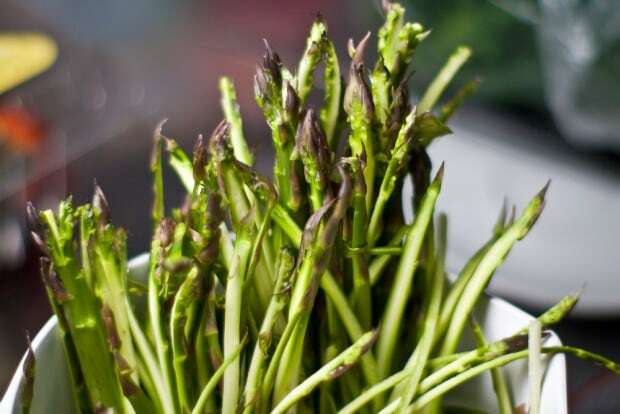 For the asparagus, use a sharp knife or mandoline (or a multi-blade knife if you have one) to made noodles out of each spear. If you're using a knife or multi-blade knife, I find it's easiest if you leave the tough bottoms of the stalks attached and use it to hold onto the stalk with one hand using the knife to slice with the other. If you want thinner noodles, just make one set of cuts, then rotate 90 degrees and make another. You can either boil the asparagus noodles in salted water, or saute them in a little olive oil. Careful not to overcook them as it doesn't take very long. Once cooked, pour a few tablespoons of pesto on top and toss to coat evenly. 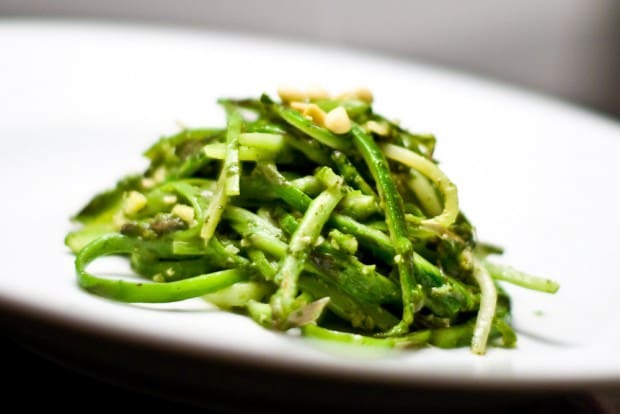 This is really innovative and a great use of ingredients in this very green dish. I love this! Can you tell us what that Japanese tool is called? It looks very handy – as I am vegetarian, I am always on the lookout for anything that will lend creativity to vegetables. Thank you! What a fabulous idea! My mind is racing with other vegetables that could take the same treatment…. I’m thinking zucchini and replacing th pine nuts with pistachios. Right, off to the kitchen then. Bye! looks great. i love the colour green and mint is definitely a cool addition. Elarael, I wish I knew what it was called, but it was a gift and I don’t have the packaging anymore. If you have a Japanese grocer near you, you might want to try the kitchen section. I’ll look online and see if I can’t find it. Christie, great idea! I was also thinking this should work with cucumbers as a cold salad. This is a brilliant idea. I love your use of mint in the pesto too. Now you’ve done it, now I need to find this gadget which won’t fit in the drawer with the others! You turned a simple salad into somethin’ neat-O! This is a really good idea for a healthy, light meal. I bet it would taste great with salmon, for non vegetarians. Thank you for visiting my site! I would love to know if you ever come across it, thank you for keeping an eye out. I scan the intertubes all the time and have never come across that one. I’ll keep looking too, as I love how you used it with the asparagus, which I can’t wait to try! Mahalo! That’s a really interesting approach and it looks delicious. I like it! That looks like a fresh and tasty way to enjoy asparagus. Your a low carb genius! Japanese boyfriend to the rescue! This is called a Negi Cutter. It is used to cut green onions and scallions, but I want one for all kinds of uses. Thanks for sharing! 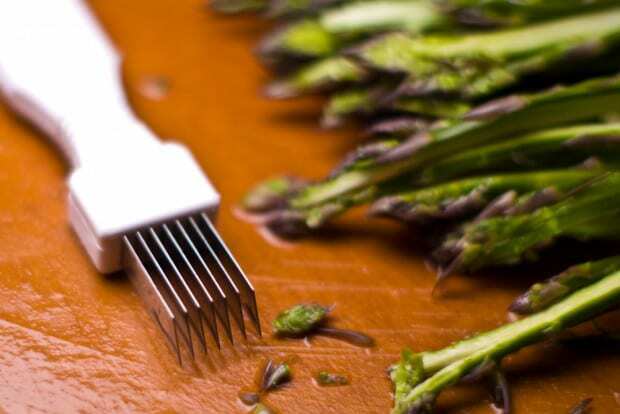 Please refer to the above picture of the multi-blade knife that is been used to cut asparagus. Greatly appreciate if you can advice me where to get the multi-blade knife. It will be of much help if the brand or manufacturer is known. Hi Marc, thanks for giving me valuable feedback. I will look it up in the website. Thanks, thanks, thanks!